Alexandra Roussopoulos was born in Paris in 1969 and is of Swiss and Greek descent. Through painting, she explores the relationship among shape, color and space. Her work has always emphasized the importance of artistic dialogue and the connection with others. She regularly collaborates in art projects and has participated in numerous artist residencies in China, Greece, Ireland, and Slovenia. Alexandra has participated in the activities of the APDV art center in Paris, which brings artistic action to the heart of government subsidized housing areas. She has organized and curated several exhibitions, Water and Dreams at the Kamchatka gallery in 2007, Mauvais Genre in collaboration with Isabel Duperray at a Moroccan gallery in St Nazaire in 2009 and a cycle of nine exhibitions at the Galerie épisodique . Alexandra has exhibited in Switzerland (at Art and History Museum of Neuchâtel, Louis Moret Foundation and the Manoir in Martigny, davel 14 in Cully, Villa Bernasconi in Grand-Lancy, Ferme Asile in Sion, and LAC in Vevey), in France (at L’Art dans les Chapelles, la Cité Radieuse de Le Corbusier in Marseille, the apartment/studio of Le Corbusier in Paris, Marie-Victoire Poliakoff gallery in Paris, and the gallery Scrawitch/Julien BEZILLE in Paris), China (at Pifo Gallery and the Art Gallery Lelege in Beijing, Shanghai Yard Art Gallery, and National Wetland Museum in Hangzhou) and New-York (Zürcher Gallery). She was awarded the visual arts prize of the René Liechti Foundation in Switzerland in 2010 and the "November in Vitry" painting prize in 2002. She regularly participates in workshops in France and abroad (in France, at La Hear, Mulhouse and ESBA Le Mans and in China, the Academy of Fine Arts of China and the University of Fine Arts in Hangzhou). Studied at Heatherley’s school of Art et Camberwell School of Art in London, then at the École Nationale Supérieure des Beaux-Arts in Paris. Three main series of paintings (red, green, blue), each of them creating a different universe for each colour. Research on colour and texture, with paint applied to paper laid out on canvas. Experiments around sketchbooks. 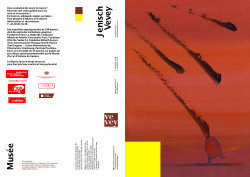 First presentation of the work on the invitation of Jan Voss at the Julio Gonzalez gallery (Arcueil, France), as part of the event « Rencontres 96 ». 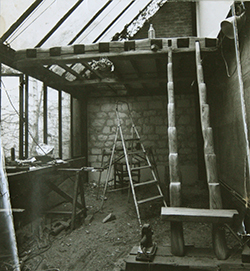 A decisive encounter with gallery owners Marie Cornette and Aldo Pajarin, leading to a first solo exhibition at the Cornette-Pajarin gallery (rue du Roi de Sicile, Paris) in 1998. 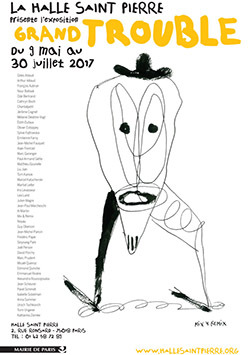 Group exhibition at the Studio de l’Image in Paris. First exhibition abroad in 1999 at the Planque Gallery in Lausanne, Switzerland. The work becomes more radical, with almost monochrome paintings and square formats. Use of fluorescent colours transforming the light that hits them. Several collaborative projects with other artists: Joan Ayrton, Eric Bauer, Jean-Baptiste Farkas, Lou Inglebert, Catherine Jacquet, Aurélia Jaubert, Martin Mc Nulty, Jean-André Orlandi, Julie Safirstein, Jean de Seynes and Romain Taieb. Teaches Visual Arts for five years at primary school “L’École Aujourd’hui” in Paris. In 2002, receives the International Painting Prize of the city of Vitry-sur-Seine. 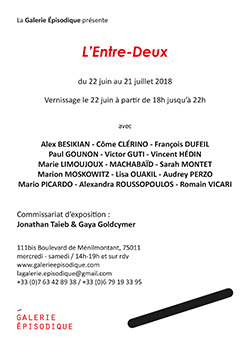 Another key encounter: Marie-Victoire Poliakoff, leading in 2003 to a first exhibition at the Pixi-Marie-Victoire Poliakoff gallery (rue de Seine, Paris). Work focusses on the temperature of colour (atmospheric colours evoking the sky and the colours of time). Gradual departure from the traditional canvas, first by rounding up the edges of the frames, then by creating her own shapes-frames: geometric forms first, then organic ones. Colour is pushed out to the edge of the painting. Plays with space, borders and changes of scale. The paintings are verging towards sculpture. Several collaboration with the journal Architecture à Vivre (Eric and Dominique Justmann). 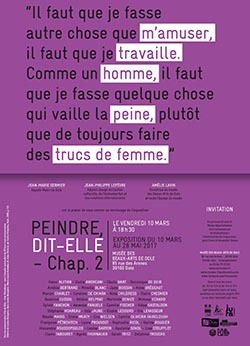 In 2004, exhibitions at the Parc de la Villette (Paris) during the event Vivre, c’est habiter. Painting and drawing workshops with socially excluded and elderly people for the charity “Les Petits Frères des Pauvres”. In 2007, curates her first exhibition L’Eau et les rêves featuring 65 artists at the Kamchatka gallery in Le Marais (Paris). The show runs for two months, with different guest curators and invited artists every week. 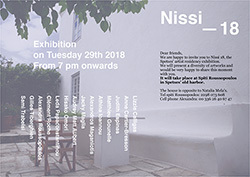 The shapes-paintings take over imaginary spaces, slip into images of the real world (historical archives, works of art, maps…), are hung from the walls in minimalist or baroque architectures, and interfere with existing displays in museums or in other artists’ exhibitions. They are projected in impossible projects – ones that haven’t been completed or are just too big to be built. In 2008, creation of murals in the Aftam shelter for immigrants, working with the residents and the association Unicités. Invited by Marie-Fabienne Aymon to show with Martin Mc Nulty at the Louis Moret Foundation in Martigny (Switzerland). In 2008, publication of the monograph Alexandra Roussopoulos by the Louis Moret Foundation, co-published with the Pixi-Marie-Victoire Poliakoff gallery and with financial support by the State of Valais’ council for culture. 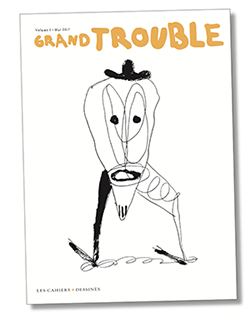 The book was designed and produced by Maxime Tétard (les Graphiquants) with texts by Elisabeth Lebovici and Brooks Adams. In 2010, receives the René Liechti Foundation’s Visual Arts prize (Switzerland). Exhibition in Le Corbusier’s “Cité Radieuse” and at the festival “L’Art dans les Chapelles”. The shapes are turning into architectures and exploring tri-dimensional space. In 2011, collaboration with landscape architects Bernard Chapuis and Georges Vafias at the Parc Mosaïc in Lille (France). From 2010, teaches painting at Prép’art, a school preparing students to art school entry examinations. Encounter with Yvon Nouzille, the founder of the APDV arts centre, who places art at the heart of the community, in the public spaces of council estates. 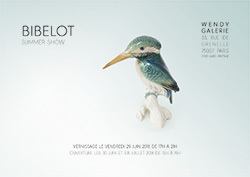 In 2011, takes part in the exhibition Bonjour organised by APDV. 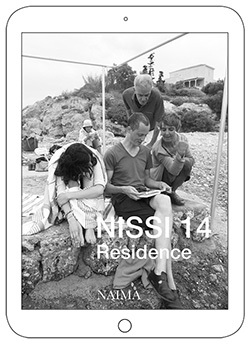 Artist residencies: invited by Brane Kovic to Slovenia, by Isabel Duperray to Chamalot in the region of Corrèze (France), and by John Mc Hugh to the Achill Heinrich Böll Cottage in Ireland. Each of these trips left a strong mark on the evolution of the work. 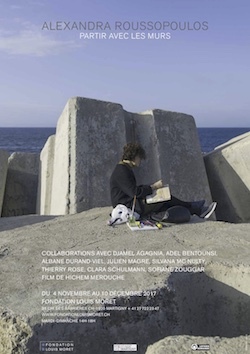 Encounter with Julien Bézille, leading to participating in one of the Scrawitch gallery’s first solo exhibitions, with independent curator Catherine Ferbos-Nakov as the exhibition’s guest curator: the first in a series of future collaborations. Residency in Zhang Jiajie, China, with thirty international artists. First experiements with rice paper that shrouds and filters the colours to the point of making them disappear. Return to the traditional frame and canvas, with a recent series of paintings interrogating pictorial balance through the notions of composition, surface, depth and texture. The work increasingly reflects the importance of the link to others. 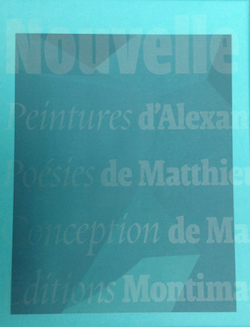 The paintings are reproduced in several catalogues of solo and group exhibitions, and appear in the contemporary section of Le Livre libre (Les cahiers dessinés, 2010). 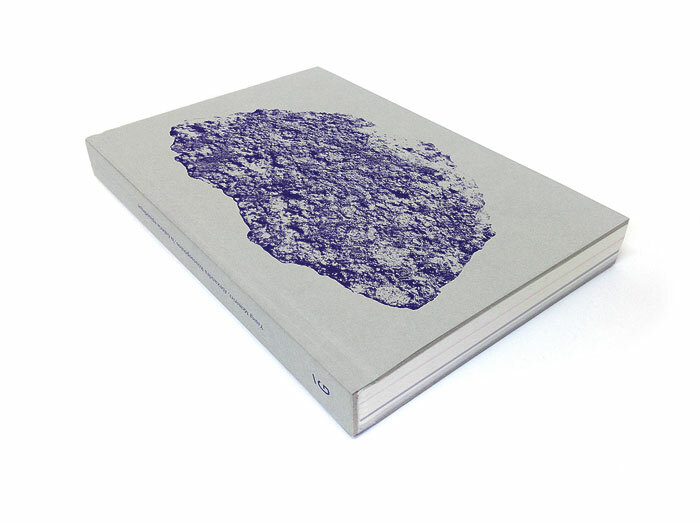 A monograph, Forma fabulis, is edited by Frédéric Pajak in 2011 and published by Éditions Noir sur Blanc, in the collection “Les cahiers dessinés” (production: Lea Lund / texts: Brooks Adams, Elisabeth Lebovici, Natacha Nataf, Emmanuelle Lequeux / interview with Marie-Fabienne Aymon). The Euclidian fields of geometry seem to go all soft, fuzzy and eccentric in Alexandra Roussopoulos’s shaped canvases. Their forms are familiar, but their facture does not feel absolute or predetermined. Her paintings aren’t so clean and finicky. We are not dealing here with Los Angeles Fetish Finish of the 1960s and ‘70s, though those lacquered and plexiglas forms are certainly alluded to. The artist is explicit on this point: “I like them a little dirty,” she says. “I want them to be like skin. I have no desire for perfection.” Roussopoulos’s “Flaque,” “Anguleuse,” and “Euclidienne” are floating abstractions she begins with fluorescent acrylics and gradually paints down to pale, shimmery tones best seen in daylight. Their stretchers are cobbled together with bits of cast-off wood, and their undersides, and edges, are thick with layers of paint. Their heavy physicality makes their illusionism – of emptying out, of nothingness – that much more tangible. (Photographic details of the “Flaques” suggest human bodies – scrunched together at some early ‘70s love-in or avant-garde theater workshop.) Geometry and feminism, biomorphism and automatism freely intermingle in her art. Roussopoulos makes sensitive and humorous use of readymades – the traced outline of a plastic cord used to attach scissors to packaging is one of her best shapes, like a flying saucer. Her biomorphic cutouts of brightly colored foam and girlish plastic notebook covers (the metallic Op pattern looks to be a high-school fave) bespeak a calm, yet intense collagist. Roussopoulos is a child of ’68 (born in 1969) – one of those children of the counterculture who had a rarefied view of the situation. Her parents were a golden couple of the Parisian avant-garde: the Swiss-born Carole Roussopoulos a well-known feminist filmmaker and social activist; the Greek-born Paul Roussopoulos an activist as well as a physicst, painter and maker of architectonic kites. (I once saw these kites, which have never been exhibited, in a bedroom in the family’s house on the Greek island of Spetsos. They were beautiful, lucid things.) Alexandra grew up with her parents and brother Geronimo in a open-plan modernist house in the 14th, where she still live and works, now with her own two teenage daughters and their father, the British-born artist Martin McNulty. Memories of Carole Roussopoulos’s feminist collective “Les Insoumuses” are palpible in the house, particularly on this 40th anniversary of May ’68, and Alexandra says she found the mood of those ‘70s women’s barn-storming collaborations “joyous and optimistic.” Utopian space is everywhere apparent in her art. The “Espace Inventé” depict walls and floors floating disembodied: no windows, ceilings, doors, only the occasional pillar. To me, they don’t suggest ideal art galleries as much as tactile spaces for babies to crawl around in. In these child-proofed zones, the illustrated versions of Roussopoulos’s reliefs are like big eyes -- omniscient presences presiding over the safe emptiness. These quizzical drawings – at once autonomous and illustrational -- remind me of Blinky Palermo’s carefully ruled yet lushly colored diagrams for his wall paintings, a body of work Roussopoulos says she “adores.” Palermo’s wall drawings and fabric paintings, in their site-specific relation to architecture and their fragmentary, laid-back look, are more than ever having a seismic effect on younger artists, especially painters. Roussopoulos’s “Eaux Mouvantes” -- decoupages of painted canvas -- are resilient, floppy items (no delicate butterflies these) that can be adhered to wall or floor. In a studio visit, she scatters them, then gathers them up nonchalantly. (She likes to put her art in a single suitcase when she travels.) I sense a renewed fascination with ‘60s and ‘70s Process Art: the fragile wall reliefs of Richard Tuttle; the scrappy, biomorphic still-life paintings of Elizabeth Murray; the floor-hugging, polyurethane foam “spill” sculptures of Lynda Benglis -- all come to mind as precedents for Roussopoulos’s “rad” flexibility. The notebooks are private fields where public armies of abstract shape coalesce. In Frontière (2006), myriad outlines of France jostle for position in a tight frame. (Roussopoulos has taught art at a progressive primary school in the bobo-intello 14th for many years.) This drawing recalls a classroom exercise in which the kids are made to rethink the notion of borders, national and otherwise. Even her titles are loaded. “C’est quoi l’histoire?” sounds harmless enough, but it’s a killer to answer. “Anguleuse” is a pun on “engueuleuse” -- an ironic take on the angry, shrewish stereotypes of the women in the ‘70s Insoumuses. The “Euclidienne” conjure up a group of radical female geometers from the 1790s – French Revolutionary syntheses of the artist’s mother and father principles. From Claude-Nicholas Ledoux to Tatiana Trouve, French art has flirted with a dream of functional geometry -- pyramids with belching smokestacks, glossy trapezoids with electric cords dangling. Alexandra Roussopoulos’s art is part of this tradition, though it shuns the more dystopian aspects of revolution. The liberation movements of her childhood are still fresh in an art that she sees as intrinsically “female.” Her “Flaque” remind me of a fragment of my own American art-historical childhood: a huge field painting by Georgia O’Keeffe, Sky Above Clouds IV (1965). her largest painting ever, a painting so big in fact (243.8 by 731.5 cm) that they couldn’t get it of the Art Institute of Chicago in the ‘60s, back when I was growing up there in the suburbs, and so it remains there (finally acquired by the museum in 1983). Roussopoulos’s “Flaque “ don’t have this constraint of size, but they are as dreamy as O’Keeffe’s enormous horizontal painting, with its minutely gradated recession of row upon row of blank white shapes retreating towards a impossibly high, and rainbow-tinted horizon. C’est une histoire d’attraction, comme cette quatrième dimension, par laquelle vers 1920, en Russie, Kazimir Malevicz et les Suprématistes transposaient leur surface picturale en un champ magnétique. Avec les collages d’Alexandra Roussopoulos, cette histoire-là, peut-être, se rejoue. Ses formes en effet, se baladent et se fixent et — ou plus précisément se collent — sur des images existantes, sous l’effet de deux univers, deux plans de conscience conjoints. Prenez Paysages Occupés, 2009. Le premier plan est celui de la balade imaginaire que ces formes entreprennent sur un ruban de route infinie dont les photographies d’Eric Tabuchi narrent quelques-uns des arrêts. Ceux-ci sont constitués par les édicules, modernistes et vieillis, de pompes à essence aussi désaffectées que les routes et les paysages auprès desquels elles ont été établies. Et donc, on imagine l’itinéraire des formes d’Alexandra Roussopoulos, roulant tant bien que mal sur leurs parties convexes… Ou bien, au contraire, puisque c’est l’imagination qui œuvre, elles peuvent tout aussi bien se déplacer sans heurts, dans un mouvement glissant, ondoyant ou ondulant. En tout cas, les voilà sur l’image, arrêtées à la pompe. Certaines s’y sont accrochées. L’une semble cernée dans son mouvement dirigé vers la station-service, les autres paraissent plutôt avoir trouvé leur lieu et s’y encastrent. Le deuxième plan de conscience visuelle intervient ici pour rappeler la dimension physique du collage, « occupant » l’image, comme le rappelle leur titre — Paysages occupés. Cet encombrement spatial que produit le collage sur chaque paysage photographique est signifié par la place que prend la forme, tandis que le dessin illusionniste de la tranche, parfois ombrée, de celle-ci, agrandit son impact visuel et transforme son échelle. Dans sa relation avec son nouveau contexte, celui auquel elle est greffée, elle devient un énorme relief aux contours irréguliers de courbes et d’ovales, concrétion « bio-morphe », comme celles de Jean Arp et de Sophie Taeuber : organique sans jamais se référer à la nature, gommant la distinction entre animé et inanimé, objet et sujet, références animales et végétales. Sa surface colorée, sensible, propose une relation sensuelle au cadre qui l’étreint. Dans ses collages, Alexandra Roussopoulos s’approprie des espaces construits par d’autres. Chaque série porte un titre, distinguant plusieurs ordres d’images. Outre le « western » des stations service, on trouve aussi des vues d’exposition, puisées dans un fonds de cartons d’invitation, de cartes postales, de photographies de magazines, composant l’ensemble Je M’expose. La série Sisters incite des sujets féminins, seuls ou en couples, à partager leur espace. Sous le nom d’Enfance, sont réunis les collages qui s’invitent à des scènes du (joli) mois de Mai 1968. Les images d’époque sont en noir et blanc et ce sont les formes d’Alexandra Roussopoulos, qui les attirent, ainsi, dans ses couleurs pastel, rose ou orange. L’une d’entre elles s’arrête dans la continuité d’un panneau de signalisation triangulaire — le signe « danger = école » —, planté seul au milieu des prémisses d’une barricade formée boulevard Saint-Michel par des grilles d’arbres, derrière laquelle une foule est regroupée, attendant pacifiquement. Deux autres sont disposées, tels des galets, près d’un couple souriant couché sur l’herbe, aux côtés d’une pancarte plus revendicative : « Non aux licenciements ». Une troisième se plie devant une montagne de détritus (résultat d’une grève des éboueurs ?) au seuil de laquelle passe une femme en parapluie. Une quatrième s’étale sur une grande table conviviale, où l’on mange, où l’on boit et où on lit Libération. L’image est déchirée sur l’un de ses bords, apportant par cette effraction, comme un trouble léger quant à l’origine de l’image : un souvenir personnel ? La série des Sisters s’attache à un genre d’activisme jubilatoire. Chacune des formes invitées dans l’image poursuit, en effet, l’action des femmes qui y sont installées : prolongeant l’ampleur du geste triomphant de deux bras levés ; assise dans un fauteuil, pour faire conversation ; côte à côte avec une patineuse à roulettes en pleine démonstration ; fondant en volutes, sur une poutre métallique élevée de la Tour Eiffel, parmi les étoffes en remous, d’un corps féminin dansant au dessus de la ville ; ou reliant des corps jumelés, jeunes ou plus vieux. En empathie, en camaraderie. Ici, il s’agit moins des projets non réalisés que d’ « effets accomplis », le collage ayant pour qualité de représenter la part de désir que contient chaque utopie. -	Qui aimes-tu le mieux, homme énigmatique, dis? Ton père, ta mère, ta soeur ou ton frère? -	Je n'ai ni père, ni mère, ni soeur, ni frère. -	Vous vous servez là d'une parole dont le sens m'est resté jusqu'à ce jour inconnu. -	J'ignore sous quelle latitude elle est située. -	Je l'aimerais volontiers, déesse et immortelle. -	Je le hais comme vous haïssez Dieu. -	Eh! Qu'aimes-tu donc, extraordinaire étranger? -	J'aime les nuages... les nuages qui passent... là-bas... là-bas... les merveilleux nuages! Il ne peut rien advenir. Il ne devrait rien advenir. Il n’adviendra rien. Une bulle nous protège. Elle nous éloigne du monde, ses cruautés et fatalités. Elle nous en sépare d'un voile de gaze, gaz. Ainsi les formes ennuagées qui flottent depuis toujours dans les collages et toiles d'Alexandra Roussopoulos se sont récemment immiscées dans ses vidéos. Dernier avatar, cinématographique, d’un motif qui obséda l’artiste dès qu’elle eut trouvé son propre langage ; ultime séjour d’un voyage qu’elles ont réalisé en naviguant au fil de l’œuvre, glissant avec grâce d’un médium l’autre, pour finalement venir ronger, tel une amibe aux contours archaïques, la pellicule. Une étape à laquelle l’artiste dit être venue « tout naturellement, de façon organique, comme une nécessité, un désir qui s’assouvit ». Ainsi ces formes numériques glissent-elles sur le réel enregistré par la caméra, pour s’y offrir comme des cellules de haute protection. Qu’on s’y libère ou s’y emprisonne ? Nul ne peut le dire ; leur peau est poreuse et refuse de révéler où l’intérieur, où l’extérieur. Elles sont trous, autant que renflement. Mais quoiqu’il en soit, rose bambin, jaune tout petit poussin, bleu ciel, leurs pastels font bouclier. Ils ont beau jouer la brume indéfinissable, ils s’avèrent, à l’épreuve, protection des plus coriaces. Armada de douceur, exhortation à la légèreté, obligation de sérénité... Avec leurs arrondis incertains, ces toiles échappées venues hanter les courts-métrage de l’artiste ont peut-être l’air diaphane, leur substance de rien est aussi tenace qu’une toile d’araignée. C’est pourquoi elles arrêtent les ennemis, les enveniment, les digèrent. En des gestes qui doivent tout à l’instinct et peu à la culture, elles jettent leurs doux rais sur les sinistres sorts et les étouffent dans l’œuf. Ici on ne souffre ni ne meurt. La force de vie en sa mousse expansée neutralise les acteurs du mal. Elle se fait ventre de femme pour prévenir de tout risque, elle nourrit de son sucre et son sang la beauté en son sein, elle est plénitude de ce qui n’accouchera jamais que d’autres biorythmes. Un conte de fée ? On y croirait presque. Mais, et cela tient à quasiment rien, à qui sait lire entre les arrondis, le tacite contrat de lecture de ces images porte, en un de ses alinéas, une invite à la méfiance. Une exhortation au double fond. Voit-on dans un film la grave sérénité d’un père exhalant la fumée ? Un fantôme vient fusionner avec le halo de la cigarette. La quiétude d’un chemin au hasard d’un petit village suisse ? C’est à une chapelle mortuaire que le panoramique mène, comme guidé par cette même parenthèse flottante. «Plutôt que les couleurs vives, j’aime les couleurs entre deux eaux», lance Alexandra, qui a tourné ces films en un moment de grande douleur. Mais avoue aussi son « envie d’humour, de légèreté ». Sans doute aime-t-elle donc ces nuances car elles savent comment se comporter quand arrivent les rapides, et qu’elles avertissent de leur ambivalence, comme d’une ligne de flottaison sans cesse changeante. Elles sont, pour reprendre les mots de l’artiste, « présence-absence ». Il faut se méfier des couleurs qui dorment, et se souvenir qu’elles peuvent sauter soudain de leur berceau pour assaillir la réalité et ses fictions. Il faut s’allier aux formes douces, car dans l’atelier si architecturé où travaille Alexandra, elles savent opposer « une certaine résistance, ainsi que proposer un miroir au ciel si présent dans cette maison ». Nulle image ne pourra advenir. Fort de son trône tout en courbes, le monochrome est ici en son royaume, avec ses dégradés délicats. La figure est bannie, et avec elle un grand pan de la réalité. Impossibilité du documentaire : le film ne semble pouvoir livrer que l’intime, et non susciter la prise de parole collective. Il n’est pas destiné à ce que le monde s’en empare. Il est le cocon de l’individu, enfin. Celui que l’artiste peut s’approprier absolument, personnellement. Le reflet de son inconscient. « J’aime cette tension entre abstraction et intimité », dit-elle. Et pourtant ces nuages qui s’apposent aux images filmées sont aussi comme la mise en abyme de tous les possibles du cinéma. Ils semblent des écrans en attente d’une projection quelconque. Drive-in offert à tous les imaginaires de passage. Billboard négligé en plein désert, vierge de toute publicité. Ils jouent le dénuement mais vivent en fait plutôt mal cette posture. Car dès qu’un souvenir passe dans le coin, ils le gobent. Dès qu’un fantôme pointe, ils l’englobent. Ils sont des pièges à mémoire comme d’autres objets tout aussi ronds, aux extrêmes du continent nord-américain, sont des attrape-rêve. Les merveilleux nuages d’Alexandra Roussopoulos se la jouent donc aussi microbes, affligeant le présent de la mononucléose du souvenir : seul nucléus, son unique noyau. Celui aussi d’où surgira l’avenir. La graine où se cristallisent toutes les saisons de la vie. Nulle parole ne pourra advenir. Il faut se taire et écouter le silence de ces films. Même la nature refuse d’y parler. Seul le chant y est admis, mais il vient lui aussi du passé. Car l’enfant des années 70 se souvient des discussions tardives de ses parents et de leurs amis qui accompagnaient ses débuts d’ensommeillement, de « l’excellence et de la puissance de cette parole, de son énergie et de son ébullition ». Puis elle ajoute : « sans doute le moyen d’exister à côté de cela réside-t-il justement dans cette abstraction que j’ai choisie. Non parce que je doute de l’efficience de ces mots, que j’ai vu prouvée au quotidien. Mais parce que j’ai besoin de silence, ainsi que de trouver une démarche plus individualiste ». Ses nuages sont autant de bulles d’une bande dessinée qui auraient oublié le dialogue, choisi le blanc plutôt que les mots. Qui se concentreraient sur un vide qui n’a rien d’un néant. Ils s’offrent finalement comme une latence, lactescence, qui paradoxalement nourrit: l’artiste autant que celui qui se voit confronté à son oeuvre. Parce que, quand on y regarde à deux fois, entre deux eaux, tant y advient, survient, souvient. Ce sont deux sœurs jumelles, nées de parenthèses enchantées. L'une n'a jamais quitté l'épaule de sa mère, la suivant partout dans les rues, les manifs, les usines occupées (il faut dire que c'était la caméra légère dont tout le monde rêvait). L'autre, au contraire, n'abandonnera jamais son nid : le 15, villa Seurat, à Paris. Hier joyeux bordel insurrectionnel, cette maison d'architecte abrite aujourd'hui le monde flottant d'Alexandra Roussopoulos. Toutes ses «Formes» et «Contre-formes» reposent ici. En suspens et en silence, comme d'étranges cumulus. Nimbés d'auras flashy, mais pétrifiés en un ciel de traîne. Seuls les plafonds semblent échapper à leur magnétisme de pierre. Par espoir de revoir la Fée des lilas ? Qui viendrait gentiment crever le toit de l'atelier ? Car la surnaturelle diva, au firmament de l'effraction chez Demy, fut aussi l'abracadabrante complice de Carole Roussopoulos : Delphine Seyrig était chez elle villa Seurat. Et de tous les combats. Fondatrice du collectif vidéo Les Insoumuses, c'est d'une même voix qu'elle appelait les femmes à la révolution et conseillait à Peau d’âne d’exiger du roi, son père, l’impossible : «une robe couleur du temps». Alexandra, de 5 à 7, donnera-t-elle Forme à cette fable? Je repense à l'affiche de son exposition «Avenir incertain, utopies multiples». Où on la voyait, sur un pont de Paris, jongler à bout de bras avec une Forme plus grande qu'elle. Plus légère et transparente que l’air. Plus bleue que le ciel d'été. Alexandra sur le pont des merveilles. Suffirait-il, pour le franchir, de s'affranchir du réel? Dans l'espace rêvé de l'atelier ? Pour toute réponse, Alexandra y pioche un tableau, dont un rayon de soleil perce le fond secret : des coupures de presse. «Je maroufle toujours des magazines féminins sur la toile avant de les recouvrir de peinture blanche très liquide, explique-t-elle. C’est pour moi un geste iconoclaste, purificatoire, afin d’évacuer ces images envahissantes, agressives, pas vraiment belles. Mais qui sont devenues une base, une sorte de quadrillage, une structure.» Les images aguicheuses d’Elle magazine affleuraient encore sur ses premières toiles, comme collées à une vitrine recouverte de blanc d’Espagne. Tout ne devait pas disparaître. «Répandre la peinture sur des châssis si lourds exige beaucoup de temps, poursuit-elle. Alors je me surprends parfois à lire un article. C’est très contrariant !» Très physique aussi : courbée en avant, les bras écartés à quelques centimètres du sol, la vandale mime l’opération. Quel enfant immense berce-t-elle ainsi ? De quel lait enduit-elle ses toiles ? Rose, mauve, jaune, vert… Survient l'étape du fluo. Une luminescence qu'elle étale sur les premières couches de badigeon, avant de la chasser avec un peu d'eau et de nouvelles nappes blanches. Aussi prodigieuse que le phosphore sous l’écume, mais invariablement renvoyée à la lisière du tableau. Pour mieux le border. Et en révéler la beauté marginale : «La couleur crée la Forme. Je peins en fluo la tranche du châssis pour que la couleur se reflète sur les murs. À la manière d’une aura. Je travaille désormais sur la limite, mais sans me limiter à l’objet fini de la peinture. C’est le mur qui apparaît alors. J’aime cette confusion.» Alexandra dit aussi ne plus lutter contre les accidents ; le papier glacé des magazines ne lui sert plus à lisser l'abstraction crayeuse de ses peintures. Les poussières de l’atelier s’y accrochent comme des fantômes, des bulles éclatent à sa surface. Les pages arrachées seraient peu à peu devenues une simple «présence». Celle de sa mère ? Carole, avant d’être la vidéaste que l’on sait, travailla à la rédaction de Vogue. Une idée qui ne l'avait jamais effleurée… Alexandra préfère penser que sa peinture est «libre et mobile». Telle une eau vive. J’y vois plutôt du lait caillé. Des petits pans de mur passés au lait de chaux. Soleils calcifiés, détachés de la maison familiale de Spetses, en Grèce. Châssis dilatés, immobiles comme des lézards, pleins de petits cratères et de mirages brûlants. Que se passe-t-il donc à fleur de chaux ? Carole est tombée malade et Alexandra a accroché ses archipels fossilisés aux murs blancs d’une chapelle. Carole s'est éteinte et Alexandra a filmé une Flaque diaphane, ourlée de bleu, depuis la maison du Valais où ses parents ont vieilli jusqu’au seuil d’une chapelle où tout finit. Une Flaque livide qui n’avait plus rien à cacher. Libre et mobile, mais pour aller où ? Alexandra a fini par sécher ses Flaques dans la chaleur d’un atelier de céramiste. Acceptant pour la première fois de s’engager dans un long processus sans maîtrise du résultat, de se concentrer au point d’«abandonner quelque chose», d’oublier ce que l’on fait, et de le perdre dans un fracas. Avec l’envie de travailler la terre, au risque de s’y brûler. «J’avais besoin d’être au chaud», se souvient-elle. Depuis peu, elle fabrique des petites maquettes très colorées. Des architectures minimales à la géométrie oblique, caressées par des Formes molles, glissant le long des murs, du toit, du plancher. On croirait voir un précipité de son parcours de peintre, où les Flaques d'aujourd'hui embrasseraient les Euclidiennes de ses débuts. Euclidiennes qui, par leurs contours arrêtés, adressaient des clins d’œil aux premières amours de Paul Roussopoulos, physicien de formation… À cela non plus, Alexandra n’avait pas vraiment songé. Alors quoi ? Une chambre à soi ? «Oui, une chambre à soi», sourit-elle, les yeux au ciel. La Fée des lilas ne passera plus villa Seurat. Alexandra a construit sa couleur du temps. Dans une chambre d' écho aux murs de chaux. D'Alexandra Roussopoulos je connaissais les "nuages", ces formes rondes, presque sans bord, en tous cas sans contrainte, sans restriction, sans angles. Son nouveau travail introduit de la ligne droite, de la frontière. Et m'incite d'ailleurs à revoir les nuages comme beaucoup plus tenus, plus délimités que dans mon souvenir. D'ailleurs, étaient-ce des nuages ? Elisabeth Lebovici y voit aussi des flaques, "formes d'en haut et formes d'en bas". Formes qui me font penser aux farces et attrapes de notre enfance, à ces grosses taches d'encre en plastique ou silicone, qu'on posait sur les papiers de nos parents, devant un stylo ouvert. Ensuite, merveille, il suffisait de les décoller pour que la faute disparaisse, pour que la dispute s'éloigne, pour que la sanction laisse place au rire. Merveilleuses taches pour rire, merveilleuses fautes en l'air. Mais les nuages-flaques d'Alexandra n'ont rien d'une eau noire ou d'une encre. J'en garde une impression de vert tilleul, de bleu ciel, de rose rose, de blanc coquille d'oeuf, peut-être de jaune fluorescent. Dans ses nouvelles toiles et gouaches je vois du noir et du brun, ils sautent aux yeux dans les couleurs claires, ils les soulignent et les interrompent. Des boîtes dépliées, des maisons ouvertes, à plat. Mais aussi des fleurs, comme si les nuages rebourgeonnaient en formes rondes dans la tranchée des plis. Soudain une chaise, et d'autres formes simples, humanoïdes peut-être, pions d'un jeu d'échecs ou petite foule impassible, en attente, prête à se multiplier encore, à se déployer. Un monolithe, ailleurs, se tient en équilibre hors d'un lacis qui m'évoque les méandres de la Loire vus par satellite : la netteté des lignes de l'eau quand elle doit trancher terre et sable, dans une sorte d'affirmation que les courbes ne sont pas floues, qu'il est faux d'associer seulement le rectiligne à la rigueur ; qu'on peut ondoyer droit, en somme. Rien n'est fermé dans ces quadrilatères. Tout est ouvert et même plus qu'ouvert : étalé, mis à plat. Ouverture maximale de la perspective, éclatement de la troisième dimension : ce que fait toujours la peinture, mais les deux dimensions sont ici comme posément assumées, expliquées au sens d'un dépliement. Du ciel et du sol, on est passé aux maisons, aux volumes, mais aplatis, exposés. Mises au défi d'être planes. Cette ouverture ne va pas sans angoisse. Volumes grands ouverts sous un ciel écrasant : il y a certes chez Alexandra le Matisse des collages mais aussi, ici, le Chirico des grandes ombres. Alexandra Roussopoulos n'est pas exactement figurative, mais me reviennent des lignes de Luc Tuymans ou même d'Edward Hopper en voyant ses nouvelles peintures. Cette inquiétante familiarité que racontent leurs tableaux à lumière contrastée ; ces ombres noires et longues sous les tours, sous les églises, sous les arches, sous les bâtiments, je les vois ici aussi. Et les ombres très courtes de midi au zénith, quand le ciel dévoré de soleil ne laisse aucune échappatoire. Je prends un de mes auteurs archi-préférés, Arno Schmidt. Leviathan. Le narrateur sort de sa cellule pour dix minutes seulement : "Soit ; peut-être pourrai-je cette fois-ci trouver quelque chose. Au moins des images nouvelles. Ciel bleu vif et horriblement dépourvu de nuages (plutôt un ciel sans dieux que sans nuages !)" Au loin s'en vont les nuages, au sol demeurent les flaques, jusqu'à s'évaporer, jusqu'à être absorbées... Chez Alexandra, ils et elles ont les formes que prend l'eau versée sur une table, par ce phénomène si joli qu'on appelle ménisque : l'eau ne se répand pas toute, même sans obstacle ; sur une surface horizontale, elle s'arrête, élève ses propres bords. Ainsi la flaque de mercure présente un haut rebord, quand l'huile glisse et se répand toute. C'est la loi de Young-Dupré - comme nous l'apprend Wikipedia : "Dans une situation de mouillage partiel où le paramètre d'étalement est négatif, la loi de Young-Dupré donne l'expression de l'angle de contact statique d'une goutte liquide déposée sur un substrat solide, en équilibre avec une phase vapeur (...). Cette loi théorique n'est cependant observée qu'avec des solides parfaits." Alexandra Roussopoulos fait de la mécanique des fluides. Dans cette nouvelle série, elle étudie celle des solides, mais en se souvenant de ce que les fluides en disent : liquéfaction ordonnée des boîtes, solidification organisée des nuages, envol toujours possible des flaques. Attention au décollage - sans qu'on sache s'il s'agit d'une échappée vers le ciel, ou du haut-bas-fragile de boîtes toujours prêtes à s'ouvrir. En ce rêve, toutes les images, tous les paysages et souvenirs fusionnaient. Sur les murs blancs, la tranche colorée des châssis crée un halo indécis, telle l’aura lumineuse qu’hallucinent les migraineux. Les couleurs sont des voix étouffées. Par les angles arrondis, la courbe infuse. Le gris est couleur du temps : matière du ciel, où tu recrées la respiration des nuages et, plus secrètement, âme du temps, que mesurent nos cœurs battants. 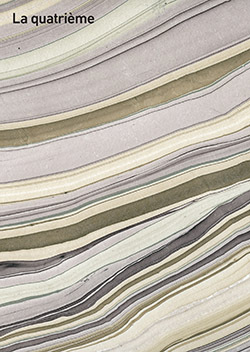 Tes gris s’écoulent, en une infinité de demi-teintes, de nuances : de la neige sale au ciel d’orage, de la source pure à l’océan, de la nostalgie légère au chagrin. Tes gris sont le sang du fleuve. L’un des premiers Grecs, Héraclite, y reconnut le temps. Avec tes doigts solides, tu arraches au temps des lambeaux de souvenirs, de rêves, de sentiments. On oublie comme l’accouchement d’un rêve est sanglant. Souvenirs d’un paysage, d’un sentiment, tissés dans la matière volatile du rêve, dont le goût vague, au réveil, persiste. Un filtre s’interpose entre le souvenir et les yeux : le papier de riz, qu’entre deux époques de couleur, tu glisses. On voudrait retourner au paysage, au sentiment. Mais le rêve, le souvenir, la brume grise du matin se dissipent. Tes Dépaysages sont filtrés par le papier de riz rapporté de Chine. Quand je les regarde, des images du Fleuve de Jean Renoir se surimpriment. En Inde, où jamais Auguste Renoir ne peignit, son fils Jean mit en scène ses tableaux. Le générique du Fleuve est dessiné avec de la poudre de riz, délayée dans l’eau. Dans mon rêve, il pleut. Le halo brillant de la pluie rend les spectres visibles. Sous la pluie grise et douce, les fantômes n’ont plus peur. Ils sortent. Ils nous fixent, derrière un voile ou un filtre. Fantômes de nos défunts, traces de nos vies fantômes — nuages de pensée, de cigarette, aura du souffle, déambulation des rêveries, harmonie musicale des liens —, ils trouvent l’hospitalité dans ton œuvre. Le regard est un nuage flottant. Ce n’est pas un hasard si les grands cinéastes peintres (Jean Renoir, Roberto Rossellini) achèvent leur méditation sur le mystère bienfaisant du ciel. Ciel et fleuve, aube furtive du souvenir, obscurité poignante du crépuscule, se confondent. Descartes, aussi, disait : l’œil ne voit pas. En révélant la chair grise du temps, ton œuvre rend notre œil à sa nature même : spectrale. Si la confrontation des œuvres de deux artistes est l’un des exercices préférés des conservateurs de musée et des commissaires d’exposition, elle est rarement pratiquée par les artistes eux-mêmes. Aussi est-on d’abord surpris quand une jeune peintre décide de confronter ses œuvres à celles d’un maître de l’art moderne comme Serge Poliakoff. Entre la soumission à l’égard d’un « père » et le désir de s’affirmer face à lui, il y avait lieu d’hésiter. La réponse d'Alexandra Roussopoulos est plus directe et plus juste, qui explique très simplement qu’au point où elle est arrivée dans son travail, ses recherches ont rencontré et interrogé l'œuvre de Serge Poliakoff (disparu en 1969), et que de tels dialogues sont heureusement normaux entre artistes, et même indispensables. De fait, Alexandra Roussopoulos pratique assidûment le dialogue artistique, et elle l’apprécie : elle a pris l’habitude de travailler avec d’autres, assurant en 2007 le commissariat d’une exposition présentée à la galerie Kamchatka, à Paris, L’eau et les rêves, qui réunissait 65 artistes, installant ses œuvres dans d’autres espaces, par exemple en 2009 à la chapelle Saint-Jean, au Sourn, dans le Morbihan, ou dans l’appartement-atelier de Le Corbusier en 2010, ou encore en sollicitant d’autres artistes dans ses expositions personnelles (tout récemment, Hakima El Djoudi). « […] j’ai toujours eu besoin de partager, de participer à des projets réalisés en commun, que ce soit en tant qu’artiste ou en organisant des expositions collectives. », dit-elle, et aussi : « J’aime la communauté […], c’est essentiel de se confronter avec les responsables d’un lieu d’exposition ou avec les visiteurs, les étudiants ou les artistes ». Serge Poliakoff donc, et l’on comprend immédiatement que la rencontre ne répond pas à une sollicitation extérieure, ne s’inscrit dans aucun projet mais correspond à un appel intérieur. De prime abord, le rapprochement des œuvres des deux artistes n’est d’ailleurs pas évident : là où Poliakoff use de couleurs vives, saturées, et de contrastes non moins vifs entre elles, avec une touche bien visible, Alexandra Roussopoulos utilise au contraire une gamme de tonalités claires et peu contrastées, qu’adoucit encore l’emploi d’un papier chinois qui recouvre la surface de la toile et agit ainsi comme un filtre duquel sourd une couleur éthérée, comme si elle était vue à travers un air purifié des milliers de grains de poussière qui rendent sensible la couleur. Quant aux formes, elles s’inscrivent aussi différemment sur la surface de la toile : celles de Poliakoff restent sur un plan frontal, sans perspective, où seuls les chevauchements des couleurs rendent sensible une certaine profondeur, tandis que celles d’Alexandra Roussopoulos s’organisent dans un espace à plusieurs dimensions. Les rapprochements que souligne la mise en page opérée par l’artiste en collaboration avec Jean-Claude Chianale éclairent la confrontation des œuvres avec celles de Poliakoff, suggèrent ce qu’elle a pu reconnaître en elles et ce qu’elle a pu y puiser : ici, la commune irruption d’une couleur vive, presque fluorescente, dans un ensemble plus uniforme ; là, un jeu comparable entre formes arrondies et formes anguleuses. Il y va donc de la construction du tableau, de la façon dont s’y agencent formes et couleurs pour créer ce déséquilibre tendu mais harmonieux que visent l’un et l’autre. Chez Poliakoff, la densité de la couleur, lorsqu’elle entre en contact avec une autre couleur, crée une vibration : les formes bougent, croit-on, animées par la couleur qui leur confère autonomie et mobilité. « Ce n’est pas à la forme que je pense », précisait d’ailleurs le peintre : « Comme l’architecte, j’occupe des espaces ici et là. » Si les moyens utilisés par Alexandra Roussopoulos sont différents, la préoccupation est comparable : « occuper des espaces », comme l’indiquent les Paysages occupés (2009) et autres Espaces inventés (2011), comme l’indiquent aussi les multiples références à l’architecture dans un travail qui peut investir non seulement des lieux d’exposition (Pas si minimal, 2010), une chapelle bretonne (L’art dans les chapelles, en Bretagne, en 2009), la Cité radieuse de Le Corbusier, à Marseille, mais aussi recourir à des relevés d’architecte (Archilibre, 2009), à des architectures en linogravure (Le Refuge, 2010) ou peintes à la gouache (Espaces inventés et La Datcha, 2011). Pour investir ces espaces, pour les « occuper », la peintre a élu une forme de prédilection, la forme arrondie, entre le nuage et le double archaïque, une forme qu’elle projette autour d’elle et qui occupe les architectures, les paysages et même les visages, connus ou inconnus, réels ou imaginaires. Dans les architectures, Alexandra Roussopoulos accroche sa forme aux murs et au sol, parfois en deux morceaux ; sur les photographies, elle la peint ; ailleurs elle peint aussi l’espace où la forme est ensuite projetée. La forme ne précède pas l’espace, elle l’investit, elle l’occupe. Il y a quelque chose d'une appropriation magique dans cette projection : réappropriation du passé, comme le montre la série Enfance où la forme vient se mêler à des images souvenirs ; conjuration de la mort aussi : dans une série de vidéos, interférences (2010), la forme s’échappe de l’atelier pour précéder la caméra sur un sentier qui mène à une chapelle mortuaire. Mais ce geste d’appropriation, qui passe par la médiation d’une forme, signale aussi chez l’artiste une distance, sinon un retrait : la forme avance en éclaireur, elle précède et porte le regard. Et lorsqu’elle s’arrête sur un mur ou sur une carte postale, dans un paysage ou une architecture, sorte de tâche incongrue, claire et vaporeuse mais dont on lit l’épaisseur dans la découpe géométrique, elle interroge finalement, par sa présence étrange, irréductible, la place qu’elle occupe dans l’espace. Librement mue, la forme aléatoire vient révéler ou rappeler l'espace "pur", un peu comme les grands blancs voulus par Mallarmé dans Un coup de dés, et indiquer ce que toute image élaborée, toute construction, occulte aussi nécessairement. 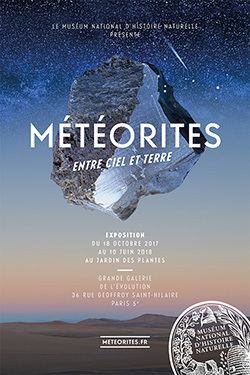 Que la question de la place de cette forme dans l’espace interroge aussi finalement le rapport de l’artiste à son art, on peut le déduire de la proximité qu’Alexandra Roussopoulos entretient avec la forme qu’elle a créée et que révèlent les titres donnés à certaines de ces séries : Sisters (2009) où elle porte sa forme à bout de bras sur un pont parisien dans un geste dont on ne sait s’il vise à la soutenir ou à la retenir, et surtout Je m’expose (2009) où le « je » de l’artiste se confond avec la forme exposée. Habiter l’espace, ou plus précisément rendre un espace habitable, ce serait ainsi restituer doucement une perception diffuse, et très personnelle, de l'espace primordial vacant, cet "Ouvert" qu'évoque Rilke dans ses Élégies. À cet égard, les œuvres les plus récentes, objets de ces Conversations avec Serge Poliakoff, marquent un moment important dans la démarche d’Alexandra Roussopoulos. Car si jusqu’ici ses formes mobiles dont la couleur vive, cantonnée aux contours, semblait vouloir s’échapper, projetaient d’emblée l’œuvre au-delà de la surface du tableau jusque dans les espaces d’emprunt chers à l’artiste, ces formes ont maintenant réintégré l’espace de la toile. En reconstruisant le tableau dont elle avait un temps séparé le châssis de la toile, puis en réintégrant la forme dans l’espace du tableau, Alexandra Roussopoulos repose, avec les seuls moyens de la peinture de chevalet, la question des rapports entre formes et couleurs. La forme arrondie n’est plus plaquée sur un espace extérieur, elle imprime sa marque aux architectures sévères, incurve les lignes, assouplit les droites, comme si elle avait infusé l’espace de la toile pour le faire sien, l’ouvrant du même coup à ses horizons à elle, une percée d’un bleu intense ou un lent dégradé dérivant du bleu clair vers le blanc d’un nuage. L’espace ainsi créé est un espace de plénitude. Étale, la lumière claire irradie également toute la surface de la toile et les formes y occupent l’espace qui leur est imparti dans une immobilité tranquille et rassurante. Il n'y a pas de heurt entre elles : si elles se chevauchent légèrement parfois, elles ne s’affrontent pas, et l'on dirait qu'elles retiennent leur souffle dans un univers encore inexploré et incertain qu’un peu trop de bruit pourrait faire disparaître. Dépaysages et non plus Paysages occupés : avec son préfixe privatif, le néologisme qu’a choisi Alexandra Roussopoulos pour titre de cette série laisse penser à un travail d'analyse, sinon de déconstruction, en tout cas de renoncement à ce qui pouvait passer pour acquis, et par suite l’abandon d’un langage où une forme s'invitait simplement, inopinément, dans tel ou tel espace, pour en révéler les illusions. Il est probable que, pour une artiste toute en nuances et en réserves, franchir un tel pas fut difficile, et il faut saluer l’audace avec laquelle elle s'est contrainte à faire évoluer ses codes picturaux pour renouveler son langage, une audace dont le retour au tableau de chevalet n’est pas l'acte le moins significatif. C’est dans cette perspective qu'il faut sans doute comprendre le rapprochement qu'elle a éprouvé entre ses œuvres récentes et celles d'un peintre qui plongea dans l’abstraction – « capacité à réfléchir l’énigme de la visibilité », notait Poliakoff – comme on plonge dans l’inconnu, pour y éprouver librement toutes les ressources des couleurs. « Il ne faut pas oublier que chaque forme a deux couleurs », ajoutait-il, « : l'une intérieure, l'autre extérieure. Ainsi l'œuf, qui est blanc à l'extérieur, mais jaune à l'intérieur. Et il en va de même pour chaque chose. » Comme lui, Alexandra Roussopoulos cherche une harmonie supérieure entre intériorité et extériorité, l'espace idéal où la tension entre ces deux pôles semble se résoudre. On peut croire aussi que c'est la confiance que Poliakoff lui a enseignée, cette belle confiance dans la peinture qui amène à prendre le risque de ces déséquilibres qui seuls permettent d'inventer de nouvelles harmonies. « Entretien », propos recueillis par Marie-Fabienne Aymon, dans Alexandra Roussopoulos, Forma Fabulis, avec des textes de Brooks Adams, Elisabeth Lebovici, Natacha Nataf, Emmanuelle Lequeux, Paris, Les Cahiers dessinés, 2011. Matching the works of two artists is a popular exercise with museum and exhibition curators, but is rarely practiced by the artists themselves. It was therefore a bit of a surprise when a young artist decided to match her own works to those of such a major figure of contemporary art as Serge Poliakoff. Between submission to the “father” and the desire for self-assertion, there was plenty of room for hesitation. Alexandra Roussopoulos’ answer is both more frontal and more relevant: she explains that at this point in her research, she came upon the works of Serge Poliakoff (d. 1969) and interrogated them. Besides, Roussopoulos finds it natural – not to say necessary – for artists to dialogue between themselves. As a matter of fact, Alexandra Roussopoulos is a believer in artistic dialogue and has a long record of working with others. In 2007, she curated a group show called L’Eau et les rêves at at the Kamtchaka gallery in Paris, featuring 65 artists. Her works were hosted in various spaces such as the Saint-Jean chapel in Le Sourn (Brittany) in 2009, or Le Corbusier’s studio-flat in 2010. She has also invited other artists in her own shows (most recently Hakima El Djoudi). “[…] I always felt the urge to share, to take part in collaborative projects, as an artist or as an organiser of group shows”, she says. “I like community […]. It is essential to deal with the managers of an exhibition venue, with the visitors, the students or the artists”. Serge Poliakoff it is, then. Clearly, the encounter is not a response to an external commission, it is not part of any project but rather it stems from an inner calling. At a first glance, the parallel between the two artists is not obvious. While Poliakoff uses bright, saturated colours with strong contrasts between them, Alexandra Roussopoulos on the contrary uses a palette of light, little contrasted tones. The colours are softened even further by a layer of Chinese paper laid over the canvas, which acts as a filter letting through muted, ethereal colour: as if we were seeing the canvas through an atmosphere that has been cleared from the thousands of dust particles that make colour perceptible. 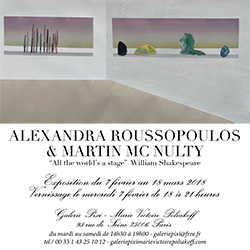 As for the shapes, they are laid out on the surface of the canvas in a different manner: in Poliakoff’s paintings, they remain on a frontal foreground, with no perspective, where only overlaps of colours suggest a sense of depth; whereas the space in Alexandra Roussopoulos’ paintings is multi-dimensional. 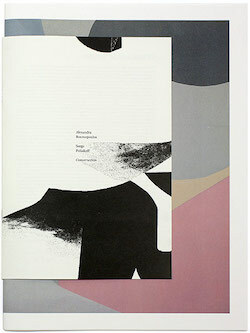 The book’s layout, designed by the artist in collaboration with Jean-Claude Chianale, highlights the parallels between her work and Poliakoff’s, hinting at what she might have recognized in them and drawn from them: the common irruption of bright, almost fluorescent colour in a more uniform background; a similar play between round and angular shapes. What is at stake is the painting’s construction: the way shapes and colours work together to create the tense but harmonious imbalance that both artists are aiming for. In Poliakoff’s paintings, the density of colour as it comes into contact with another colour creates a vibration: the shapes appear to be moving, animated by the colour that makes them appear autonomous and mobile. Indeed, Poliakoff once said: “It is not the shape I have in mind. Like an architect, I occupy space here and there”. Although Alexandra Roussopoulos uses different techniques, her concern is similar: “occupying space”. This is suggested by the titles of her series Paysages occupés (“occupied landscapes”, 2009) and Espaces inventés (“invented spaces”, 2011), but also by the many references to architecture in her work: the pieces are designed to occupy not only exhibition spaces (Pas si minimal, 2010) but also a chapel in Britanny (L’Art dans les chapelles, 2009) or Le Corbusier’s “Cité Radieuse” in Marseille; some use architectural surveys (Archilibre, 2009), others depict architectural structures using linocut (Le Refuge, 2010) or gouache (Espaces inventés and La Datcha, 2011). In order to invest these spaces, to “occupy” them, the painter has chosen her shape of predilection: something curvilinear in between a cloud and an archaic female double, a shape she projects around herself to occupy architectural spaces, landscapes and even faces – familiar or unknown, real or imagined. In an architectural setting, Alexandra Roussopoulos secures her shapes to the walls and the floor, sometimes in two pieces; on photographs, she paints them over; elsewhere, she also paints the space where the shape is then projected. The shape doesn’t precede space: it invests it and occupies it. This projection is akin to a magical appropriation: to reclaim the past, as in the series Enfance where the shape comes in and mixes with souvenir snapshots; and to ward off death too: in interferences (2010), a series of videos, the shape escapes from the studio to precede the camera on a footpath leading up to a mortuary chapel. This gesture of appropriation, always mediated by a shape, also reflects a distance, a withdrawal from the artist’s part: the shape scouts ahead, it goes first and draws the eye. When it stops on a wall or a postcard, in a landscape or an architectural structure, like an incongruous stain – light and fluffy but with a sense of depth that can be made out from the geometric cut out – the shape questions the place it occupies in space with its eerie, stubborn presence. Moving off its own volition, the random shape reveals or reminds us of “pure” space: a bit like the big white walls dreamed up by Mallarmé in Un coup de dés. It hints at what is necessarily kept hidden in any constructed image. 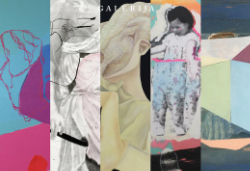 The shape’s place in space also brings up the question of the artist’s relationship to their art – as shown by Alexandra Roussopoulos’ proximity with the shape she has created, revealed by some of the series’ titles: in Sisters (2009), where she carries her shape at arms’ length across a Parisian bridge, in a gesture which appears to be either aimed at carrying it or at holding it back; and especially in Je m’expose (“I expose myself”, 2009) where the “I” becomes one with the shape that is being exposed. Inhabiting space – or rather making it inhabitable – also means gently conveying a diffuse and highly personal perception of the primordial vacant space: the “Open” evoked by Rilke in his Duino Elegies. In this respect, Roussopoulos’ most recent works – those presented in the Conversations with Serge Poliakoff – mark an important departure in the artist’s process. Indeed in her work so far the mobile shapes, with bright colours pushed out to the outline as if ready to burst out, projected the piece beyond the surface of the painting, out into the borrowed spaces chosen by the artist. Now instead, those shapes have returned to the space of the canvas. Reconstructing the canvas – after separating it from the frame for a while – and placing the shape back within the space of the painting, Roussopoulos reactivates, through the mere medium of easel painting, the question of the relationship between shape and colour. The curvilinear shape is not just laid out flat on an external surface: it leaves its mark on austere architectural structures, it bends and softens straight lines – as if its qualities had infused the space of the painting to appropriate it, as if the space was opening up onto the shape’s own horizon: a gap of intense blue or a slow gradation from pale blue to cloudy white. The space thus created is one of plenitude. A diffuse and clear glow radiates upon the entire surface of the painting, and the shapes occupy the space assigned to them with peaceful and reassuring stillness. There is no collision, only slight overlaps. The shapes do not clash; they seem to be holding their breath in an uncertain and still unexplored universe, which any sound could cause to vanish. 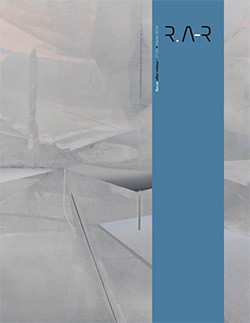 Dépaysages (“un-landscapes”), and not Paysages occupés (“occupied landscapes”): the neologism created by Alexandra Roussopoulos for this series using the privative prefix “-dé ” hints at a process of analysis or deconstruction – or in any case, a letting go of what could appear as granted. It marks the departure from a language where a shape could just unexpectedly invite itself into any given space to reveal the illusions contained within this space. Presumably, for an artist as subtle and reserved as Roussopoulos, taking such a major step must have been difficult. One must acknowledge the audacity it took her to evolve her pictorial codes in order to renew her language – most significantly, returning to easel painting. This might explain the parallel drawn by the artist between her recent works and those of a painter who threw himself into abstraction – or the “ability to think the enigma of visibility”, as Poliakoff called it – like one throws themselves into the unknown, to fully experience all the resources of colour. “One must not forget that every shape has two colours”, he added. “One external, the other internal. The egg for instance is white outside but yellow inside. 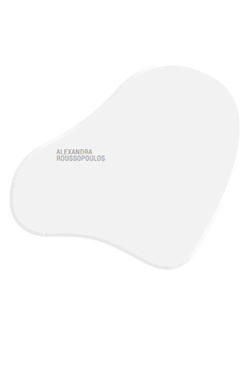 And the same goes with everything else.” Like Poliakoff, Alexandra Roussopoulos seeks a superior harmony between the inside and the outside, an ideal space where the tension between the two opposites seems to resolve itself. This might be just what the artist learned from Poliakoff: a beautiful faith in painting, allowing her to attempt those risky imbalances, the only way there is of inventing new harmonies. 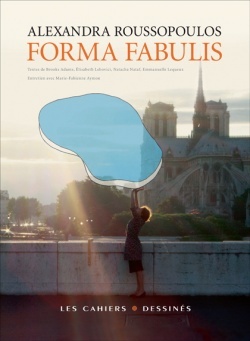 Interview with Marie-Fabienne Aymon in Alexandra Roussopoulos, Forma Fabulis, Paris, Les Cahiers dessinés, 2011. With texts by Brooks Adams, Elisabeth Lebovici, Natacha Nataf and Emmanuelle Lequeux. Quand on découvre les peintures rupestres de la Grotte Chauvet en parcourant le labyrinthe de son admirable réplique en résine, ouverte au public sous le nom de Caverne du Pont d’Arc, où foisonnent à l’identique ours des cavernes, chevaux, aurochs et lions tachetés, avec en point d’orgue la toute pre- mière « origine du monde » jamais dessinée, on se dit que les humains viennent là de marquer un point contre l’entropie. Ces images ont survécu plus de 35.000 ans pour parvenir jusqu’à nous, intactes, miraculeusement conservées, prodigieusement reproduites et l’humanité est désormais capable de les transmettre pendant des siècles et des siècles, sauf catastrophe majeure provoquant la destruction de la Terre. Oui, Chauvet, après les mésaventures de Lascaux, c’est la n de la malédiction universelle qui veut que le sort de toute image soit de disparaître après s’être dégradée plus ou moins lentement. Quand on pénètre dans la « grotte » aménagée par Alexandra Roussopoulos et Anne Sedel en mêlant leurs souvenirs intimes, on comprend tout de suite que ces deux artistes se sont liguées pour accom- plir ensemble un geste plus que symbolique contre la loi de l’entropie. L’une, avec une grande image, pose l’horizon de la loi ; l’autre, avec ses petites stèles, instaure son contraire. Puis le mouvement s’inverse : de la grande image sourd le ferment d’une négation ; tandis que les stèles formulent une autre loi. Reprenons. Signée Alexandra Roussopoulos, la grande image vidéo s’accompagne de mots. Le mouvement qui la parcourt – et il n’est pas indifférent que ce soit celui du ux et du re ux des vagues sur une grève – apporte et remporte quelques phrases, sans doute prononcées, se dit-on, par la voix de l’artiste. Ma mère, dit la voix, est... était. Redoublant le battement de la mer entre présent et passé, chaque vague qui parvient sur le sable abolissant celle qui venait d’y parvenir, la pensée qui noue l’être et l’avoir été en une litanie obsédante dénoue du même coup la fatalité de la disparition. C’est un devenir qui s’ajoute : un futur indissociable des deux autres temps, comme dans le nom de cette divinité qui réu- nit dans son Etre toutes les temporalités du Verbe. L’immortalité jaillit de l’entre deux énoncés : entre est et était la mère acquiert un sera. Les petites images, elles aussi, sèment des graines d’éternité – état de la vie qui ne connaît pas l’en- tropie. La transposition, opérée par Anne Sedel, de photos de famille en dessins au crayon sur des morceaux de planches, est un dé aux lois de la disparition. En changeant de support, en passant du papier photographique, lisse et périssable, au bois, rugueux et non moins dégradable mais por- tant une espérance de vie plus longue, les images d’un ancêtre xé dans son enfance, les images d’un enfant dans les bras d’un parent, les images d’un visage sortant de la mer, etc., changent de statut, mieux : se réincarnent. Elles ne renvoient pas au passé des êtres qui y gurent ; elles leur procurent un nouveau corps. Un corps immortel, pétri par le dessin. D’un côté comme de l’autre, l’artiste devient créateur d’une autre vie, qui commence ici et ne s’achève- ra pas ailleurs. Leurs images entament, à égale distance de l’entropie et de la néguentropie, un voyage sans n. Un voyage dans les émotions, répétables, extensibles, sans lien de parenté avec ceux que ces images célèbrent. Chaque spectateur peut les adopter comme si elles étaient celles de sa propre famille, dire ma mère, mon père, mon oncle, mes cousins. Et pourquoi pas : moi. En circulant dans la Caverne Elzévir sur les pas d’Anne et Alexandra, comme en auscultant la Grotte Chauvet, nous progressons du on au je – et de même ce texte, sans l’avoir calculé, poussé par le dé des œuvres qu’il regarde. Ainsi l’art suscite des identités impérissables, sans frontières de temps ni d’espace. Dans la Grotte Chauvet je me sens dessinateur de fauves ; dans la Caverne Elzévir je deviens aussi infatigable que la mer, aussi résistant que cent coups de crayon. Conception graphique et réalisation du livre: Jean-Claude Chianale. Textes : Hélène Prigent, Marie-Victoire Poliakoff et Alexandra Roussopoulos. Pendant vingt ans, nous avons partagé un même espace d’atelier. Formes et couleurs circulaient d’un étage à l’autre imprégnant nos pratiques respectives. L’exposition All the world’s a stage nous réunit aujourd’hui sous une forme nouvelle et surprenante. Nous avons conçu des saynètes dans lesquelles les sculptures de Martin Mc Nulty, devenues des protagonistes anthropomorphiques, sont accueillies par l’espace mystérieux des peintures d’Alexandra Roussopoulos. De cette rencontre, un monde étrange, grave et léger, silencieux et intrigant, surgit. Partir, revenir. Revenir, partir. Habiter toujours. De la Villa Seurat à Alger, de Cadaquès à Pékin, Alexandra Roussopoulos se déploie dans un mouvement perpétuel, convoquant partout l’énergie et la lumière des lieux qu’elle occupe. L’artiste présente à la Fondation Louis Moret un ensemble d’œuvres nouvelles et singulières, personnelles ou co-élaborées qui sont comme les traces d’un futur à venir, des empreintes sans cesse redessinées. Ces œuvres s’appuient sur les murs qu’elle emporte, non comme des ruines, non comme une nostalgie, mais comme une fondation nouvelle qui mêle intimement le souvenir et l’imagination, l’art et l’existence. 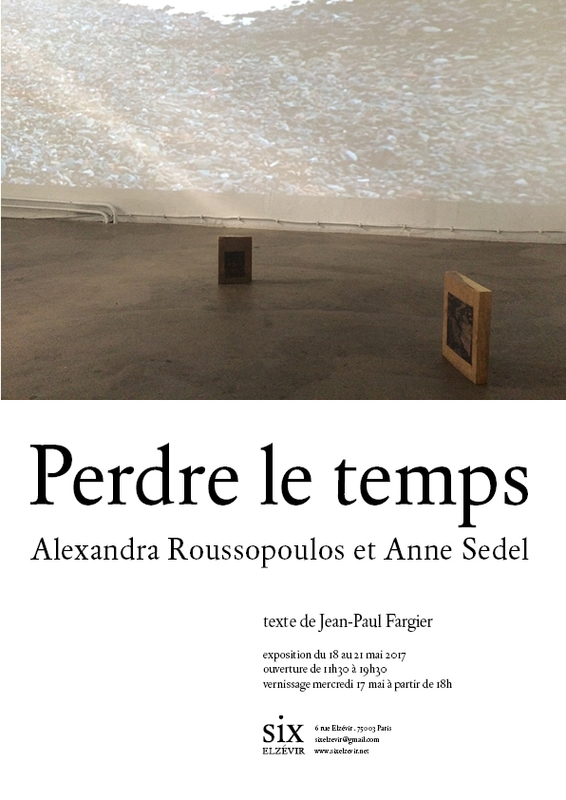 Exposition d'Alexandra Roussopoulos et Anne Sedel du 18 au 21 mai, 6 rue Elzevir à Paris. Texte de Jean-Paul Fargier. Journée d'exposition, de lectures et de conversations consacrée à l'histoire d'une maison, à quatre décennies de vie familiale, sociale, militante et artistique, le 4 mars, Villa Seurat à Paris. Commissariat, Joan Ayrton et Alexandra Roussopoulos. 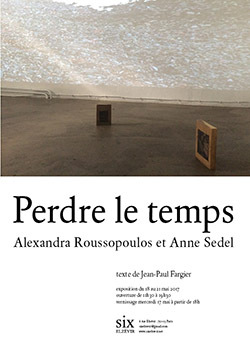 Exposition des pièces réalisées et co-élaborées par Alexandra Roussopoulos à l'occasion de sa résidence à Alger. 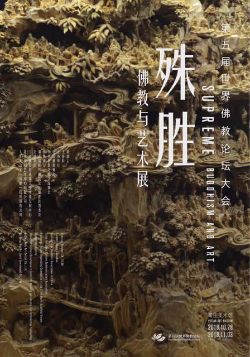 Exposition de groupe à la galerie Pifo, Pékin, Chine. 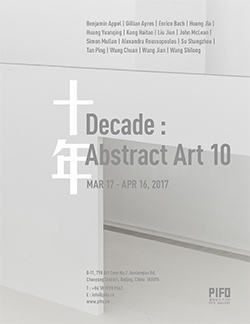 Exposition de groupe au musée des Beaux-Arts de Dole du 10 mars au 28 mai.